Last weekend Tui and Noon gave a presentation to the Klong Nang Yon community enterprise which is part of the Destination Development project by Prince Of Songkla University, Suratthani Campus. 5 local business group members such as Homestay, Bamboo Rafting, Boat rafting, Restaurant and Resort were participated in the meeting. They are interested in learning about responsible tourism. 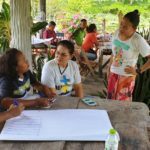 At the meeting, we discussed abouhow to be a good interpreter, Principle & guidelines for a successful community development and how to design their products and programs. Another topic was about cost calculations to identify their cost for attractive and competitive prices. 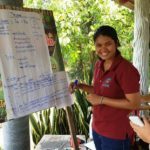 For the next step, the community members will brainstorm about their program and will start to promote the program on their social media channel, with Travel Agents, at hotels and restaurants in Kuraburi and the Khao Lak area. We are very excited to see the outcome!